Popular Nicholson’s pub right by the junction of thye Strand, Aldwych and Waterloo Bridge. Much improved from years ago this pub is now somewhere actually worth visiting. A good selection of real ales is available and they seem to be well kept – on a hot night it is obvious that the cellar is kept at a good temperature. Sharps (Coors) Doom Bar seems to be a constant here as does Fullers London Pride. The other beer selections are a bit more interesting. Food is available from the standard Nicholson’s menu. 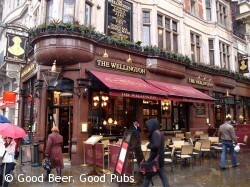 The Wellington is now much better than the nearby Lyceum – a Sam Smiths pub which used to be the must-visit real ale pub in this area.